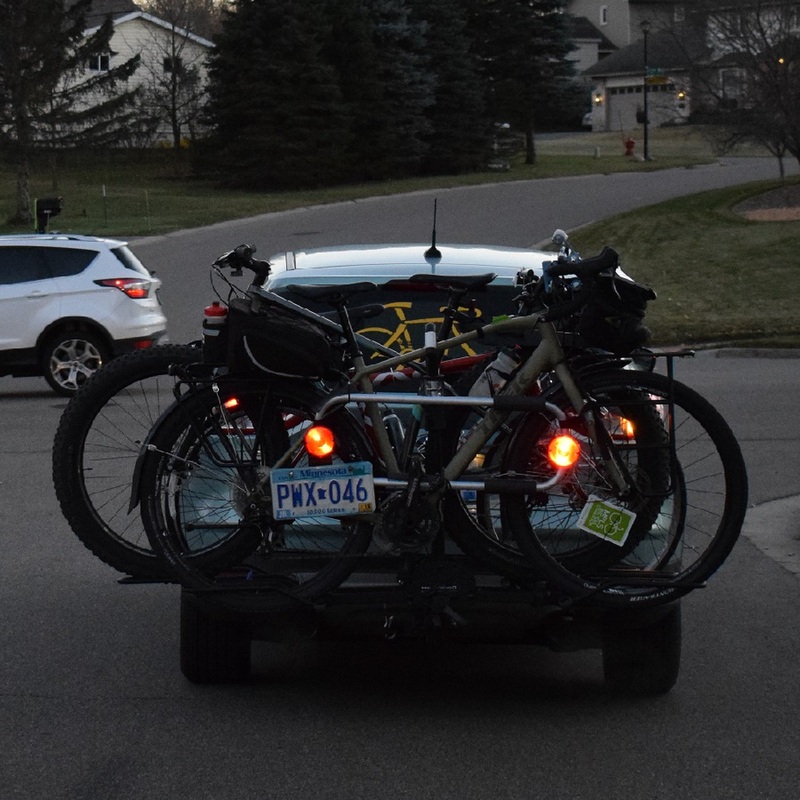 Being a huge advocate of cycling visibility, the minute I saw the Auto Rack tail light extension system, I was impressed. I was at the RAGBRAI Expo last summer where the light system was being introduced, what a great idea! If you are like me when biking you wear bright clothing and ride with bike lights so you are noticed. Seeing this extension system, got me thinking about the investment many of us have strapped to the back of our vehicles. How often are the tail lights or license plate obstructed from view? The Auto Rack is a tail light extension system offers motorist behind, a clear view of the operator intentions, ahead. Never having seen or thought much about lights for a bike rack, the Auto Rack system makes a lot of sense. It not only is an added safety feature for your car. This light system also helps protect your bike(s) you have strapped on the back. In the picture below, can you see the auto’s tail lights or license plate clearly? If you were following this vehicle and they stopped quickly would you be able to see their taillights?. Attaching the Auto Rack light system is relatively easy, especially if you already have a trailer light receptacle to plug the unit into. 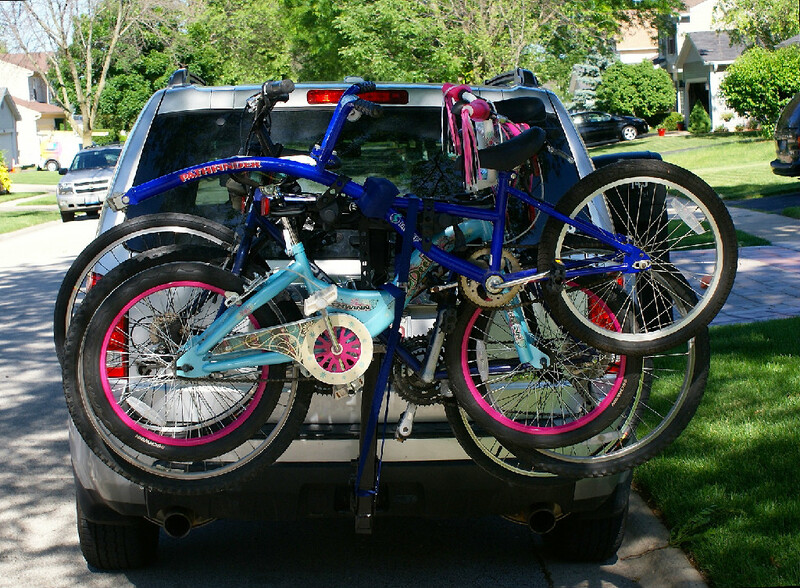 Once your bikes are secure on your bike rack, just attach the light system to the last bike mounted. The Rack comes with straps affixed on each side to easily secure the system. Plus, there are bungee cords and four (4) tubular pads that can be adjusted for added protection of your bike. See installation instructions here for more details. Searching the state statutes across the country it looks like it might be illegal throughout the U.S. when a license plate and/or tail light is obstructed from view. What we are hearing from many multi-modal touring cyclists, thankfully the law is usually over looked. However, as I mention above, it does open up the chance that you may be pulled over, which is never fun. 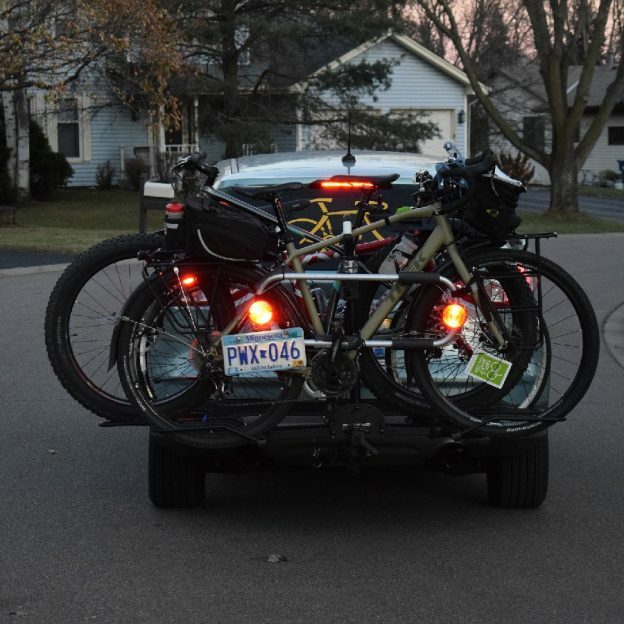 This entry was posted in News, Products and tagged Auto Rack, Auto Rack Lights, bicycle visability, bike hauling visibility, bike rack lights, cargo lights, extended tail lights, Hitch Bike Rack Lights, licence plate obstruction, license plate obstruction illeagle, Rear car light extenions, Trunk Bike Rack lights on November 26, 2017 by Russ Lowthian.